No discouragement taken, but I do need to be more humble, I always get carried away thinking about finally getting to a track! The tire requirements for the Enthusiasts class is DOT, no lower than 140 tread wear and the drive tires may be no wider than 285mm (for 2WD) or 255mm wide for AWD. Was the CR available for the AP2? If so then its likely he had more torque which would be a huge aid. Also some engine mods are allowed, mainly external, so its highly likely he is putting down more power than stock. Nothing wrong with getting excited about going to the track! I just wanted to let you know what you could go up against. I don't know about Time Attacks but at track days the driver skill makes more of a difference. Maybe there are more casual/newbie types at track days than Time Attacks. No idea, just a hunch. The AP2 is the only CR. With a few choice mods these cars fly. The S2000 in any form is a popular track weapon. Buttonwillow is a good first track. So is SOWS but I think BW is more fun (and closer). I avoided doing tracks with walls when I started - I didn't want to wad up my only car. So Laguna Seca and Sears Point were out. I tended to average one "off" per track day as I was pushing the limits. At Buttonwillow, Willow Springs, and Thunderhill, there's just dirt off track so as long as you go off straight you'll be fine. Going off sideways you could dig into the dirt and roll. Always go off straight, even if it means taking a long trip through the scenery! Three CA tracks I haven't driven on: the big course at Willow Springs, Chuckwalla, and California Speedway. Ok, so that white S2000 CR ran a 2:02.7. For reference, I ran a 2:06.0 in my 2004 S2000 (completely stock pretty much down to the tires). The CR has factory aero and I can see that white one has suspension mods, wide light wheels and wide tires. What kind of tires can you run in Enthusiast class? I'm not trying to discourage you by any means! But I think you will find modern cars to be [TheArchitect]exceedingly efficient[/TheArchitect] at getting around a race track. They do everything well and are easier to drive. I've wanted to do a Time Attack event for a while now. They look interesting although I really don't know a lot of details about how they're run. It's not racing, it's a timed competition, so I'm guessing they have open practice Saturday and then each driver goes out for a "qualifying" run to set their best time, then times are ranked. Sound about right? I haven't read the rules but it sounds complicated from what you posted. I know the faster, high profile cars (Unlimited classes?) are serious racing machines. S2000s, EVOs, NSXs, Corvettes, all big cars with big power and big wings. Big budget shops will come up from LA to run. If you just want to get out on track there's always a track day where you can run anything that's safe, build the car the way you want. It's not timed and passing is only allowed on straights initially but it's a good way to get experience on track. With in-car video you can time your laps at home after the fact, or spend a bit more for data acquisition or a HotLap Timer (not sure if tracks still have beacons for those) to check your times at the event. 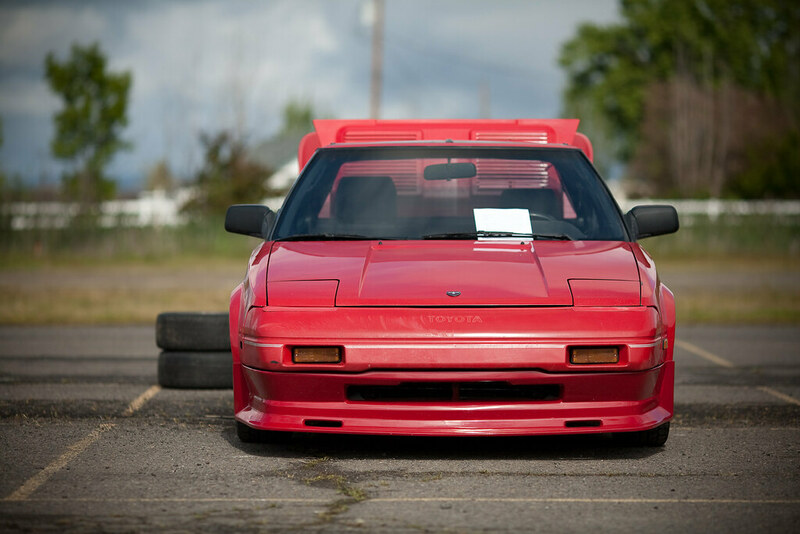 Projects and Build-Ups / Re: 1993 MR2 Turbo project car. I've had Nerves of Teal since 2005 and it's been awesome. I wouldn't go so far as to call it a beater, but I don't mind much leaving it outside or parking it anywhere. It's nice to have a carefree car like that. And it has never given me any grief. Last Saturday was the first time it failed me. I had packed it up, ready to head to the bay area for the weekend, went to start it up and got nothing. Absolutely zero. The battery was deader than a dead thing. I got a jump from my dad and took off down the street. At the end of the street I put the clutch in to come to a stop and the engine quit. What! The battery was still dead of course and I didn't have enough momentum left to take up the clutch to get the engine going. I pushed it to the curb, walked back home and got my dad's truck for another jump. I didn't trust the car at this point so I drove it back to the house and left it there. Unpacked it, threw everything in the truck and went out to the mini storage facility to grab the Turbo. Last year Kevin came over and found the battery drain on the Turbo - a trunk light that never went out. I unplugged the trunk light. :ThereIFixedIt: And put another new battery in, as the dead one wouldn't take a charge. I think the last time I drove it was in December. So back to last Saturday, I open the storage unit where Turbo hides and go to start it up. Can you guess what happens next? Nothing (you guessed right)! I was supposed to be at a friend's house by 6:00 and I was already an hour behind schedule now. I got yet another jump start and let the Turbo run for a while with accessories off while I packed it. In the end it was fine, it got me to the bay area and the battery held its charge through the weekend. Good. Anyway to make a long story longer I'll be replacing the battery in the teal car and hoping that's the end of it. The battery that's in there was put into service in 2003. I suspect the engine quitting had something to do with the car having little/no electrical power and perhaps a combination of the stereo and me applying the brakes caused the ignition or something to drop out for a second. Apparently these cars can run without the help of the ECU, by the way. Still love/hate the Turbo car. It needs working A/C, the exhaust holes fixed, a better turbocharger (and maybe a better intercooler now that that's legal!) and some clunk-b-gone for the front suspension. Also possibly a bearing went bad somewhere. I can hear what sounds like rear end whine when I'm off throttle. At some point I also want to find out why the shifter is so heavy and the transmission so finicky. It was a new (not rebuilt!) Toyota transmission maybe 40 or 50k miles ago. Possible synchro damage from a previous owner I guess, but all gears being a bit reluctant? I'm not so sure. This shifting difficulty has always been there, since 2006 when I got the car. The gates are still well defined, but it feels more like churning a bucket of mud than hot butter. The shifter is slow and heavy in its movements. I've driven a number of MR2s and not felt another one this ponderous. I think the last time I replaced the transmission fluid was in 2008, so it's been a few years but not many miles (probably 5k at most). I used Redline (MT90?) 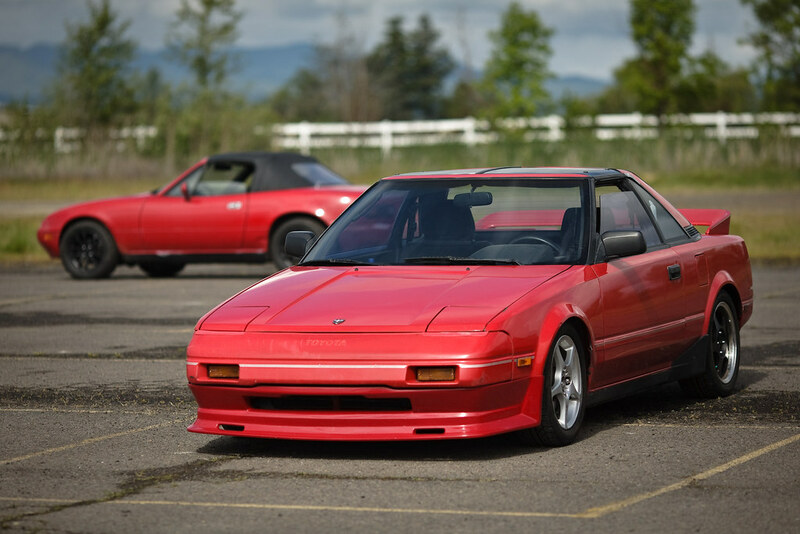 which has been excellent in my other MR2s and in the case of the '87, improved shifting significantly. There are a couple shift linkage bushings I can replace. With some effort. I would think worn bushings would cause a more sloppy or loose feeling in the shifter than a heavy, slow feeling. Oh and I took all the stickers off the Turbo car, so now it looks completely stock and boring. :) Oh and the old Pioneer stereo I installed in like 2008 works perfectly with my iPod, using the standard USB cable. Finally had to ditch CDs now that I travel a lot. 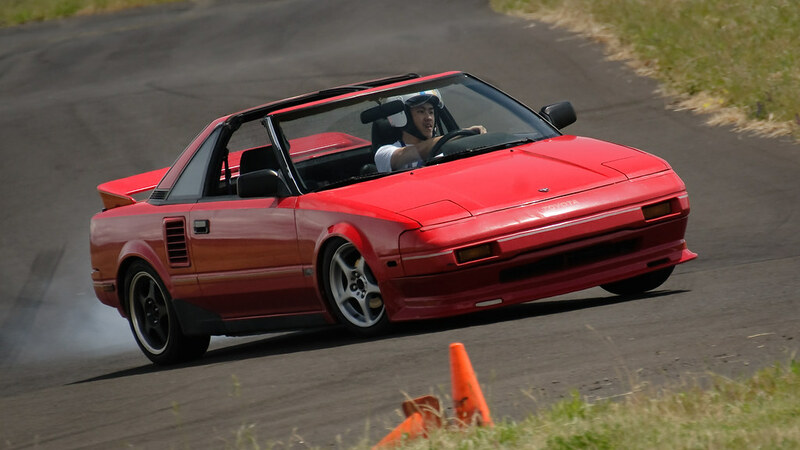 Ok so this isn't about my 93T (which runs and drives but still needs a new exhaust and a/c fixed) but I found some pics of my old red '87 NA->SC. These are from 2010. Looks like it had the front bumper replaced (or got some bad scratches), front corner markers are now amber isntead of clear, it's got a Toysport-style front lip (aren't original Toysport lips for 85-86 bumpers only? ), front wheels are from the Spyder (mismatched for why??). It also looks lower than I had it when I sold it. Anyway, gotta go, just wanted to check if you guys got the parts yet. I think it's meant to be. I also have black side skirts taking up space in the garage next to the black rear wing. And then there's the unpainted flat black air dam. Thank you Bill. :) I will always remember my roots and my old friends. You guys up for dinner or something this Sunday evening? I'm busy Saturday and basically Mon-Thurs next week, probably after that too.... I'll text BigMike and Kevin to look at this thread. Long story short I won the 2011 GT Academy and am leaving the country in 2 weeks to become a Nissan factory driver in training. My first international race will be this January in Dubai if all goes according to plan. I spent the last two weeks in Europe, the first week in Silverstone England for the Academy competition, and the second week I was at the 24 Hours of LeMans as a guest of Nissan and the Signatech racing team. So unbelievably awesome. I was this close to the 787B as it started up (for the second time in my life), and was walking on to the grid five feet behind a Pugeot 908 as it was pushed on to the track. Lots more happened but I can only type so much now as I have lots to do.